A Letter from a Gentleman to His Friend in Edinburgh. 愛丁堡 (1745). David Fate Norton. David Hume: Commonsense Moralist, Skeptical Metaphysician. Princeton University Press, 1978. J.C.A. Gaskin. Hume's Philosophy of Religion. Humanities Press International, 1978. Russell, Paul, Freedom and Moral Sentiment: Hume's Way of Naturalizing Responsibility Oxford University Press: New York & Oxford, 1995. Stroud, B. (1977). Hume, Routledge, London & New York. (Complete study of Hume's work parting from the interpretation of Hume's naturalistic philosophical programme). ^ Thomas Babington Macaulay, The History of England from the Accession of James II, 5 vols. (London: Longman, Brown, Green and Longmans, 1849-1861) ; David F. Norton, ed. The Cambridge Companion to Hume (Cambridge: 1993), p. 211. ^ Hume, D. My Own Life Nat. Lib. Scot., mss 23159, p23. ^ 「很幸運的，雖然理性並無法驅除我腦中哲學的憂鬱和精神錯亂，大自然本身達成了這個目標。透過放鬆這個腦袋或透過一些娛樂消遣，使我獲得愉悅的感官刺激，消除了所有這些惱中的怪念頭。我會吃吃東西、或是下下棋、與人聊天、與我的朋友度過美好時光；而在經過三四個小時的娛樂後，我才會回到那些哲學思考中，發現我的腦子竟是如此的冷酷、如此節制而可笑，讓我體悟到我不應該再從事這種活動了。」 存档副本. [2007-06-09]. （原始内容存档于2006-08-24）. ^ Maitland Club, Caldwell Papers II, p.177n. 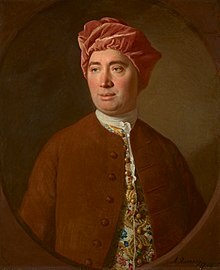 ^ 16.0 16.1 16.2 David Hume | Scottish philosopher. Encyclopedia Britannica. [2017-11-20] （英语）. ^ Krugman, Paul. How We Know The Earth Is Old. The New York Times. 2012-11-20 [21 November 2012]. ^ Richards, H. Understanding the Global Economy, Peace Education Books, 2004, p. 322. ^ Stewart, JB., Opinion and Reform in Hume's Political Philosophy, Princeton University Press, 2014, pp. 163–164. ^ Ayer, A. J. (1936). Language, Truth and Logic. London. Anderson, R. F. (1966). Hume’s First Principles, University of Nebraska Press, Lincoln. Ayer, A. J. (1936). Language, Truth and Logic. London. Einstein, A. (1915) Letter to Moritz Schlick, Schwarzschild, B. (trans. & ed.) in The Collected Papers of Albert Einstein, vol. 8A, R. Schulmann, A. J. Fox, J. Illy, (eds.) Princeton U. Press, Princeton, NJ (1998), p. 220. Flew, A. (1986). 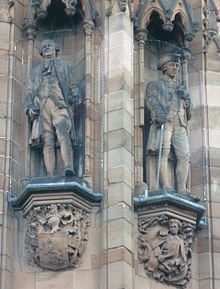 David Hume: Philosopher of Moral Science, Basil Blackwell, Oxford. Fogelin, R. J. (1993). Hume’s scepticism. In Norton, D. F. (ed.) (1993). The Cambridge Companion to Hume, Cambridge University Press, pp. 90-116. Graham, R. (2004). The Great Infidel - A Life of David Hume. John Donald, Edinburgh. Harwood, Sterling (1996). "Moral Sensibility Theories," in The Encyclopedia of Philosophy (Supplement) (New York: Macmillan Publishing Co.). Hume, D. (EHU) (1777). An Enquiry concerning Human Understanding. Nidditch, P. N. (ed. ), 3rd. ed. (1975), Clarendon Press, Oxford. Hume, D. (1740). A Treatise of Human Nature (1967, edition). Oxford University Press, Oxford. Husserl, E. (1970). The Crisis of European Sciences and Transcendental Phenomenology, Carr, D. (trans. ), Northwestern University Press, Evanston. Kolakowski, L. (1968). The Alienation of Reason: A History of Positivist Thought, Doubleday, Garden City. Norton, D. F. (1993). 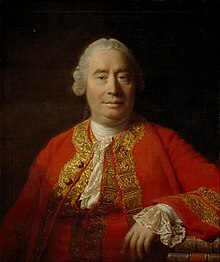 Introduction to Hume’s thought. In Norton, D. F. (ed. ), (1993). The Cambridge Companion to Hume, Cambridge University Press, pp. 1-32. Penelhum, T. (1993). Hume’s moral philosophy. In Norton, D. F. (ed. ), (1993). The Cambridge Companion to Hume, Cambridge University Press, pp. 117-147. Phillipson, N. (1989). Hume, Weidenfeld & Nicolson, London. Popkin, Richard H. (1993) "Sources of Knowledge of Sextus Empiricus in Hume's Time" Journal of the History of Ideas, Vol. 54, No. 1. (Jan., 1993), pp. 137-141. Popkin, R. & Stroll, A. (1993) Philosophy. Reed Educational and Professional Publishing Ltd, Oxford. Popper. K. (1960). Knowledge without authority. In Miller D. (ed. ), (1983). Popper, Oxford, Fontana, pp. 46-57. Russell, B. (1946). A History of Western Philosophy. London, Allen and Unwin. Spiegel, Henry William,(1991). The Growth of Economic Thought, 3rd Ed., Durham: Duke University Press. Stroud, B. (1977). Hume, Routledge, London & New York. Taylor, A. E. (1927). David Hume and the Miraculous, Leslie Stephen Lecture. Cambridge, pp. 53-4.